Holding a family fun night at your church is a wonderful way to bring the members together in a less formal atmosphere. You can spend time bonding closer with your own family, and you can get to know your fellow church members a little better while you're at it. The main thing to keep in mind when planning a family fun night at your church is that you'll need activities that are suitable for a wide age range, from toddlers to adults. Mix and match the following ideas to make sure there's something for everyone to enjoy at your next family fun night. Sing alongs are a longtime favorite. Choose a list of your church's favorite traditional hymns and contemporary Christian hits that members would be familiar with, and it's always good to provide lyrics when possible. If you choose to hold a karaoke night, make sure the song list is appropriate for a church audience. This event can provide a lot of family fun. Here are some suggestions for individual events to get you started. Hold a tricycle race for the toddlers. Have a water balloon toss where partners keep tossing the balloon back and forth between them until one drops it and they're out. The last couple remaining wins that event. Have an apple relay. The first family team member tucks an apple under his or her chin, runs to the next team member, and has to pass the apple without using any hands before they can continue. The first team to complete the relay wins. You can make fun medals to pass out to the winners, have an opening parade and even a closing prayer ceremony. There's a lot of room fun and creativity in an event like this. Who doesn't love ice cream? The church can purchase large tubs of ice cream, and set up a buffet-style station with a bevy of toppings. It's best to have people designated to scoop the ice cream, and families can add whichever toppings they like. Toppings you might want to have handy include chocolate sauce, fruit topping, sprinkles, crushed candy bars, gummy bears and more. If you decide to offer peanuts, keep them in a separate area, but let families know they are available. A growing number of people have peanut allergies, so be considerate and use some caution. This is a craft activity the whole family can take part in. If your church has a budget for the event, you can supply the craft items needed to make the basic banner and ask families to bring glue, scissors and any decorations they want to glue on their banner. Fishing line, which will be used to create the hanger for the banner. Create the sleeves for each rod by folding over about 1 1/2 inches of each short edge of the felt, and glue just the edge to the back of the banner. This should leave enough room to slip a dowel rod into each sleeve, but wait until the glue dries before you do this. Turn the banner over so the glued edges are on the bottom, and at the top and bottom of the piece. Now each family can decorate the banner to reflect their members, values and anything else that is important to them. Once their banner is decorated, they can slip the dowels through the top and bottom sleeves. Tie the fishing line securely to one end of the dowel, leave enough length to so the line can be hung from a hook or nail, and cut and tie the line to the other end of the banner. If possible, hang the finished crests on display somewhere in the church for a while. This could be held indoors or outside of the church if weather permits. Select a movie suitable for the entire family, rent a big popcorn machine and provide beverages. Families can bring blankets and/or folding chairs to sit on while they watch the movie together. 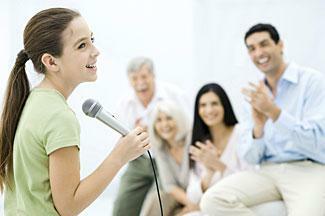 Each family puts together an act to present in front of everyone. They could do a skit or scene as a group, sing or do something else that showcases their talents. Individual family members could even perform by themselves. The idea is to gather for an evening of fun and family entertainment. Standard dinner potlucks are nice, but consider holding just a dessert potluck. Families can have dinner at home, and then bring their desserts to the church hall at a set time to share as a delicious buffet. Perhaps the church could provide coffee and other beverages, as well as paper plates, cups, utensils and napkins. This event would be nice for spring, summer or fall. Ask your local fire department if they can help set up the bonfire for safety purposes, and caution parents to watch their youngsters around the fire. The church could supply the hot dogs, buns and marshmallows for the roast, and families could bring beverages and roasting sticks. 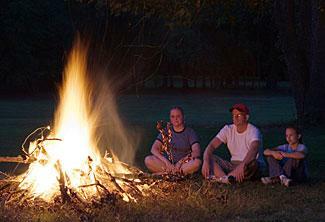 You might also incorporate an old-fashioned campfire sing along. Find out if you have any guitar players in your membership who are willing to provide accompaniment. The nice thing about bingo is that even young children who know their letters and numbers can play, too. The church can charge a nominal fee like a penny or nickel per game, and offer small prizes or the cash pot to the winners of each round. Planning a family fun event around one of the major holidays offers opportunities for related theme activities. Perhaps your church members would enjoy some of the following activities. Pumpkin carving - Everyone brings as many pumpkins as they want, and carves them together. You might also want to hold a contest to decide whose pumpkin is the best. Divide categories into Moms, Dads, kids of different age levels, etc. Winners can have their photos taken with their winning pumpkins, which can be posted on the church bulletin board, or the winners can be announced in the church bulletin, accompanied by their pictures. Trunk or treat - Have families sign up ahead of time so you know how many participants you'll have, and pass that information along so everyone brings enough candy. Each family should plan to decorate their car for Halloween and pass out treats to the trick-or-treaters. Designate parking spots so that the trunks are facing out and are accessible. Football tailgate party - This can be set up similar to a trunk-or-treat event. Everyone parks in rows with their rears facing each other. Everyone can gather, cook and visit. If your church has a large viewing screen, you can all go inside to watch the game. If not, everyone can tune their car radios to the same game a listen together. Family Thanksgiving potluck - This event brings everyone together for fellowship. Each family can bring a sidedish to pass, and the church could provide beverages and the main course (might be best to avoid turkey). During the course of the dinner, each family can stand up and share a few things their family is thankful for this year. Hold this event the week or so before the actual holiday so they are not too close together. Christmas caroling - Families can gather at church and walk through the surrounding neighborhood caroling, or you could simply gather and sing carols and hymns inside the church. It's also nice to provide cookies, coffee and warm cocoa. Christmas cookie decorating - Decorating cookies is fun, but it's even more fun if you're doing it with family and friends. Families can bring pre-baked cookies and decorating supplies, and the church can provide tables and chairs so everyone has room to set up and decorate. The church can also play carols to put everyone into a festive mood and supply beverages because there's bound to be some cookie sharing and eating involved! Egg decorating - The church could set up several egg dying stations around the hall, and families could bring any other decorating supplies they might need, as well as boiled eggs. Perhaps someone could read a few Easter stories to the children while everyone decorates. Flashlight easter egg hunt - Hunting for eggs at dusk puts a new spin on this traditional event that kids will love. You can hide real eggs around the church grounds, but it might be better for this event to hide plastic eggs filled with goodies. If you happen to have a budget that supports it, you can even put a coupon inside each egg that children can redeem for small treats or trinkets supplied by the church. Caution parents to keep an eye on their kids so no one gets lost in the dark. 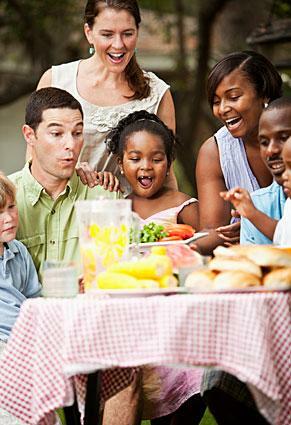 Old-fashioned family picnic - Each family could pack a basket of food, beverages and other goodies, and then gather at a set location. The church could provide a band for entertainment, and perhaps a few fun games and activities throughout the afternoon. Group gathering at the fireworks - Designate an area where the families of your church will gather together to watch the town's annual fireworks display. Think about whatever safety measures might be required for whichever event you hold. For example, have buckets of water and a fire extinguisher on hand if you're holding a bonfire, and make sure your church has a first aid kit available to handle cuts and scrapes at more physical events. With a bit of forethought, you can keep family fun night enjoyable for everyone.